Posted byMatthew Hanzel	 31 December 2016 Leave a comment on Completed the reading challenge! I thought starting a full-time job should have been a significant hurdle to my hobby: reading books. 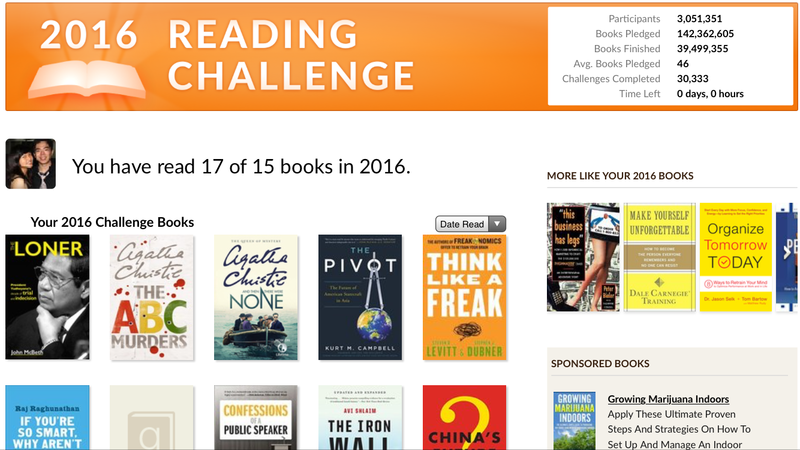 Little did I know, I actually managed to surpass my 2016 reading challenge by two books. To add to that, I also read two non-fiction books, written in gripping fashion by the one and only, Ms. Agatha Christie. And Then There Were None was especially exceptional—the story was too captivating, and it was a non-stopper. Raj Raghunathan, If You’re So Smaer, Why Aren’t You Happy? If you are reading this post, I do encourage you to read more. Reading books helps me to balance my sanity with the business of work. You may think reading non-fiction works burdening—sometimes it is. However, the new insights and understanding that you earn afterwards do make the activity worthwhile.